The snail's pace decorating is still happening over at our house. But my Roman blinds are hung in the master bedroom!! Cue the music! 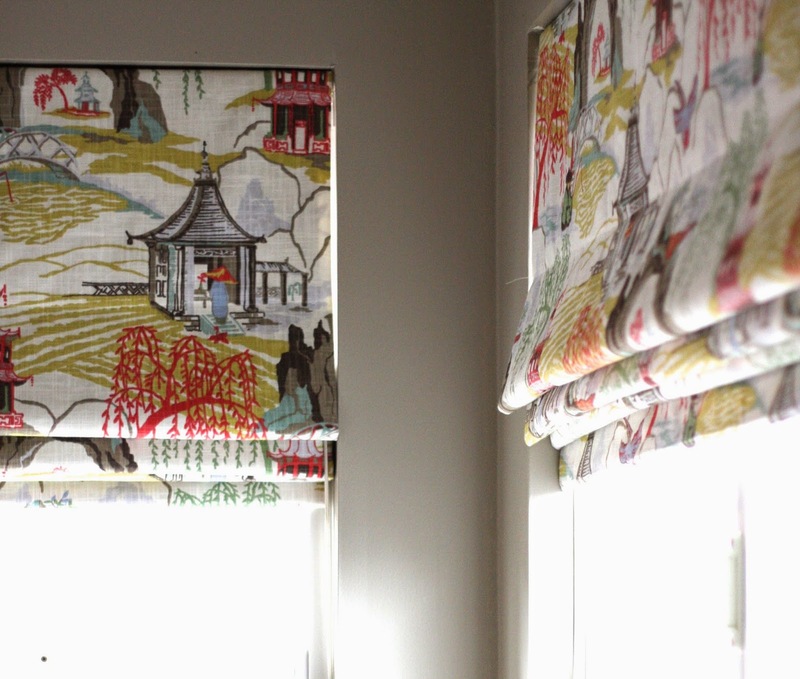 Using Neo Toile by Robert Allen from Tonic Living - my favourite source for fabric - and some blackout lining, the blinds are perfect! The bonus was the fabric matched the wall colour, which was chosen by the landlord and painted just before we moved in. Using my tutorial, I am so pleased with how they turned out! Our bedroom had mini venetian blinds that did not block out the street lights very well. With blackout lining almost all the light is blocked, only the sliver along the edges is illuminated. That will get fixed with drapes. Hoping to pop into Ikea really soon to grab my favourite go-to curtain. This room is hard to photograph as it is north-west facing with my neighbour's house blocking any western light. This is the best I could do....I have no tripod. If I waited until the room was done to my liking to show you, you would never get to see. This photo was taken just after we moved in. Boring windows, large room, no personality. 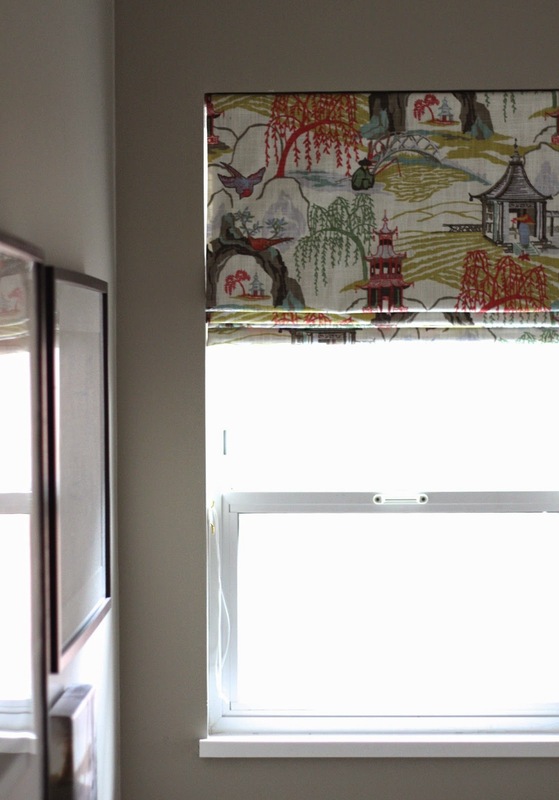 Being a bit OCD in the fabric department....I made sure that the pattern repeat lined up along all three windows. You can't really see, but I was careful to line up the Asian pagoda houses across the three windows. I can't wait to add an extra layer with drapery! Then I would like to find an area rug for under the bed and something at the end of the bed, like a bench or a chaise to give this room more personality. Those are beautiful Barbara....love the fabric! LOVE that fabric! The room is really looking elegant. Gorgeous, Barbara! They're so crisp and clean looking. Your OCD paid off. ha! ThAt fabric could not be more perfect with the wall colour and the black bed! They look incredible!! Thanks! Tonic Living has great prices on many fabrics! Love that store! Nice! Perfect fabric choice, especially with the wall colour, and I can totally see cozy taking shape! Drapery, area rug... lovely!